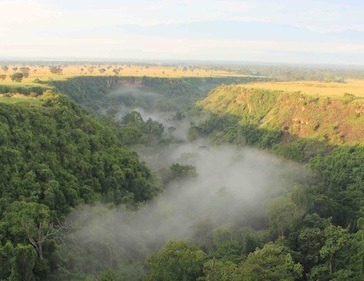 The extremely impressive Kyambura Gorge also known as the “Valley of Apes” is situated in the extreme eastern corner of the popularly known second largest national park in Uganda i.e. Queen Elizabeth National Park. The George which is 100 meters deep is drained by the waters of River Kyambura. The landscape around Kyambura George is one of the stunning features that Uganda the pearl of Africa boast of and the George is endowed with different wildlife bio-diversity that range from different Ape species to different rare wild animals as well as the unique bird species. Therefore the endowment with in the George gives an account as to why book safaris to Uganda in order to visit the George and explorer. The Kyambura Gorge is part of the extremely attractive Queen Elizabeth National Park located in the lower Western part of Uganda. The amazing George receives visitors mainly those who take their safaris to Queen Elizabeth National park. However, depending on research report produced by different researcher, it shows that the George is home to around sixteen species of the primate i.e. chimpanzees and these inhabit the impressive valley. Therefore visitors can take tour to this George to spend some time with these interesting Apes. world of its own. Therefore visitor spending some time to enter into this stunning Gorge will enable visitor to attain marvelous experience, The George which is located close to the green beautiful Tropical Rain-forest right and also near the Equator crossing offer visitor opportunities to witness the Equator crossing. The Savannah vegetation on the upper surface of the George provides the exert amount of light as well as sun shine that offers brightness where visitors can have clear view which is not even disturbed or abstracted with any the tree canopy. Exploring this Gorge will enable tourists to enjoy different tourists activities and among these include the trekking the habituated chimpanzee species located in the and besides that visitors can also participate in different guided nature walks as well as forest walks are organized with in the George and nearby areas. The other activity involves private and game watching especially the giant forest hogs, Red tailed monkeys, among others.